Lindleys-Life as we know it. : Balancing act.... gone wrong. Boys never cease to amaze me. And scars are cooler on them than on us. I'll agree with Wade on that one. And why was he standing on the basketball? My theory is "because it was there and it looked like something hard to do." Boys have that conquer it gene or something. As per your comment: I thought kindred spirits were a commonality when I was younger, too. Surprise, surprise. I suppose it has to be that way. Something unique is ever so much more precious. I'm sure glad we are sharing the earth. You make my heart happy! I LOVE how you told this story. I am so glad Wade rescued you and said no more ER. The last two pictures are the best. 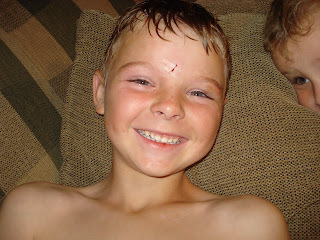 He looks so happy after he realized he was going to have the coolest scar in school! The funniest part is that he was standing on...a BALL! What the heck! BTW- You were totally meant to be the mother of boys. You are the best with those boys. Claire called me and told me to read this. I thoroughly enjoyed reading it. 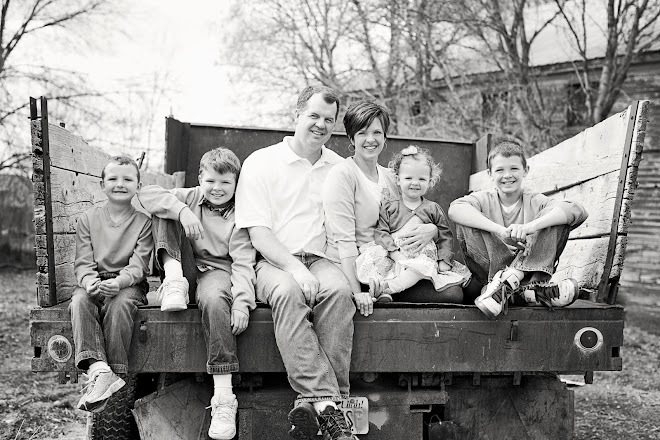 It made my day to hear a little about my nephews. 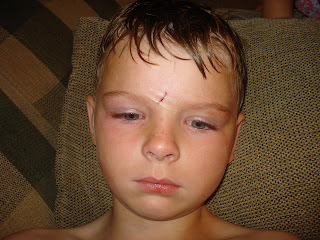 I think I was about the same age as Colby when I went to the ER 3 times for stitches. I have some pretty cool scars myself. I guess Colby takes after his Uncle Jason a little. Sorry if that scares you. Give him a hug from me and let him know I love him. Oh man! Poor Colby! Scars on boys make them look tough though! I love the way your write... you should write books, you're so entertaining! We can't wait to see you guys. Reading about those boys makes me miss you even more!